Whether you’re feeling the Great British Bake Off vibes, wanting a rainy day activity or just need some cake, baking with your little ones is a fantastic idea. I’m a messy mum with even messier kids. I’ll admit that one time, I backed out of a room after catching my kids stuffing pasta in the sofa cushions because it was keeping them quiet for five minutes. So I’m going to be honest from the get go, if you have rose-tinted memories of big wooden spoons and licking the bowl from when you baked with grown-ups as a kid, just set those aside for a minute. There is no bigger mess than baking with kids. And I’m say that as a mum of a one year old and nearly 3 year old, who has caught them feeding custard to toy robots and painting Upsy-Daisy’s nails with my Oil of Olay. However, it is well worth the clean up. The kids will have a good hour of screen-free fun and get to eat some pure sugar. While they’re getting messy you can have a hot coffee on the go and probably even get to drink a few mouthfuls! 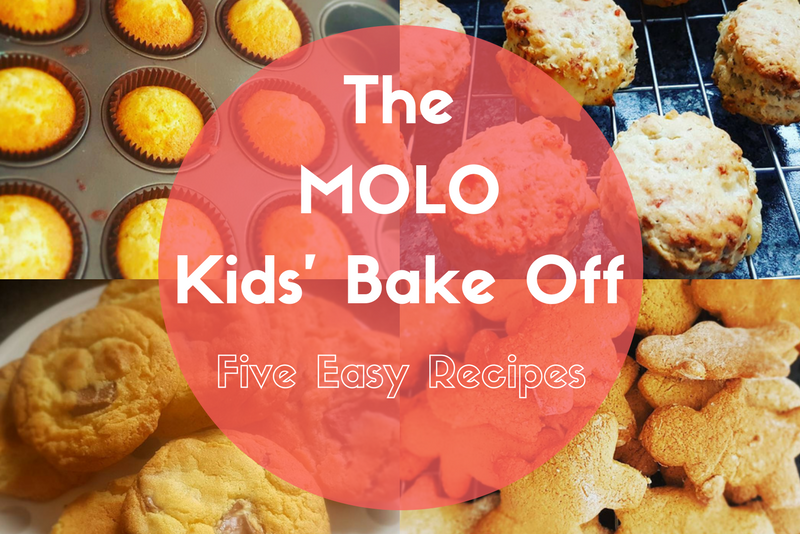 If you’re ready to embrace the mess, here are a few of my favourite easy recipes to bake with little ones. Always a family favourite, this is a great rainy day activity as between the mixing, cutting and then decorating; you can make the mess last all afternoon! We used a standard cutter from hobby craft (5″ approx.) and got over 30 gingerbread people. Preheat oven to 190c or gas mark 5 and grease 2 or 3 baking trays (or line with baking paper). Mix flour and ginger together. If your toddler is like mine they’ll already be shovelling this into their gob. It’s hilarious and horrific in equal parts as they end up with an incredibly dry mouth. Rub in the butter until it’s nice and crumbly, and then add the sugar. Commence further eating of mixture by kids. Next add your egg in and mix to form a stiff dough. If it’s not completely coming together, add a teaspoon of water. You should get a nice ball of dough now. Cover the workshop with a good sprinkle of flour and get rolling and cutting. You often see the term ‘roll dough to 1/4 inch thickness’, which is meaningless to me so a toddler finger width is just fine! Pop the cut shapes onto the baking trays and cook for about 10 minutes until they’re golden and smelling lush. Once cool, ice with funny faces using your icing pens and whatever sweeties you haven’t already eaten. This is a very basic pastry recipe which you can use for any sweet tart or pie. We use this for our mince pies at Christmas or apple pies. However this jam tart recipe is a lovely simple one to enjoy with little ones. In your large child-friendly bowl, rub the butter with the flour until you have a crumbly loose dough. Stir in your icing sugar. Add the cold water a spoonful at a time until you have a firm dough. It was at this point my one year old decided to act out the YMCA and get a considerable amount of dough in her hair. We decided to ignore this until bathtime. Generously flour your worktop (kids are great at doing this) and roll out your dough to about 2 cm or as thin as you like. Using your cutter, cut circles of dough and place into the cups of your baking tin. Fill each with a good teaspoon of jam. If you are feeling fancy you can make a little topper with your leftover dough using a smaller cutter or shape (we used a little star). Bake for 12-15 minutes of until golden. Enjoy with a hot drink if at all possible. Kids love cupcakes and this is our go-to recipe whenever we fancy a bit of baking. You will need cupcake cases and a 12 cup muffin tray. Beat the butter and sugar together until it’s all mixed. Beat in the 2 eggs. Add the flour and mix in until it’s all combined into a nice beige batter. Pop the cases in the muffin tray and spoon in the mix. Bake in the oven for 12-15 minutes or until lovely and golden. I really got into this as a messy play activity that would encourage my eldest daughter to eat something savoury as she wasn’t great with the whole weaning thing. The thing is these are really tasty and you may end up consuming half a batch by the eighth episode of Peppa Pig you’ve watched that day. Rub the butter and flour together until crumbly (and your toddler has asked for sufficient juice, having eaten a lot of dry flour). Add in your grated cheddar and slowly add the milk until you have a sticky dough. Get plenty of flour on your worktop and roll out to about an inch thickness (add more flour if it’s too sticky). Use your cutter to get as many circles as possible. If your kids are like mine you won’t have any involvement in this bit so enjoy a rare moment of peace and let them crack on. Pop your scones into the oven for 10-12 minutes or until well risen and golden. Enjoy when cooled. Cut in half with plenty of butter. You will need two baking trays ideally lined with baking paper or well greased if you have none to hand. Preheat oven to 170 degrees C.
It’s time to get your giant toddler-proof bowl out again. Mix your butter and sugar together until well combined then add the egg. (I was feeling cocky recently and let my 2 year old break an egg. Terrible idea- do not try this at home). Pop your flour and chocolate in and mix to form a sticky dough. With a tablespoon gather a heaped spoonful of dough and lightly roll into balls as per below. These bad boys will spread right out so space them out as much as possible. Bake for 10-12 minutes or until golden and fairly massive. Leave to cool at least slightly before lifting off the tray with a flat knife or spatula. Like this? Share it, and spread the MOLO love! There are loads more activities ideas in The Motherload® Guide, and you can find some great ideas for parents’ cookbooks here. Or for the latest from The Motherload®, pop over to our homepage. I’m a sleep deprived mum of 2 from Wales who runs on coffee and cake which we bake pretty much daily. Our recipes and parenting chatter journey is documented on Instagram and, there’s more on my blog.